College students, once you’ve finished interviewing for jobs, make sure to write a thank you letter to the interviewer. If you need some tips, check out the following post. If you are an internship finder who is looking to land a position, your interview could make or break your chances. To give yourself a shot at this type of internship, learn some interview tips in the following post. As an entry level job seeker, you have probably heard about standing out from the competition. This is important because employers are looking for the best candidates available in the job market. If you want to distinguish yourself from everyone else, the following post has six ways that can help. 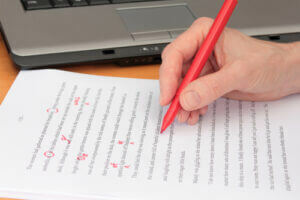 Person proofreading a manuscript. Photo courtesy of Shutterstock. Networking skills are of extreme importance when functioning at any spot on the corporate ladder, but as an executive you have even more work to do. As you know, a part of networking is communicating after you’ve completed the interviewing process. This can easily be accomplished by sending out a thank-you letter. After sorting through countless resumes and interviewing candidates, it sometimes comes down to the Thank You letter as the deciding factor for some hiring managers. The interview thank you letter is a piece of correspondence that will definitely help a good candidate win a position. Think of it as an extension of the interview itself and as a way of emphasizing any positive points that you may have made about yourself and your willingness to work for the company you’ve interviewed with.